https://www.tradingdepot.co.uk/deanta-eton-white-primed-fire-door-1981x610x45mm-wood-white-primed-45etof-dwhp610 80330 Deanta Eton White Primed Fire Door 1981x610x45mm - Wood: White Primed - 45ETOF/DWHP610 https://www.tradingdepot.co.uk/media/catalog/product/4/5/45etofdwhp610.jpg 120.99 120.9900 GBP InStock /Building/Doors /Brands/Deanta /Brands/Deanta/Complete Deanta Collection /Brands/Deanta/Eton /Building/Doors /Internal Doors/Panel Doors The 45ETOF/DWHP610 is just a small part of the Deanta door range available at Trading Depot. 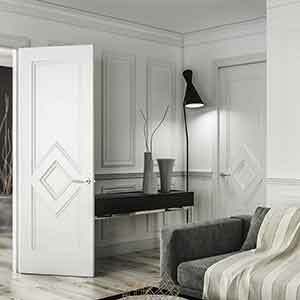 The Eton White Fire Door is a stylishly constructed White 4 Panel Shaker Door. By taking the classic Victorian 4 Panel style, Deanta have added contemporary straight edges to the panels of the door, making it look much more in line with modern homes. With a high quality, fire rated timber in the core and being supplied with 15mm lipping across the entire frame, the Eton looks great and performs very well.